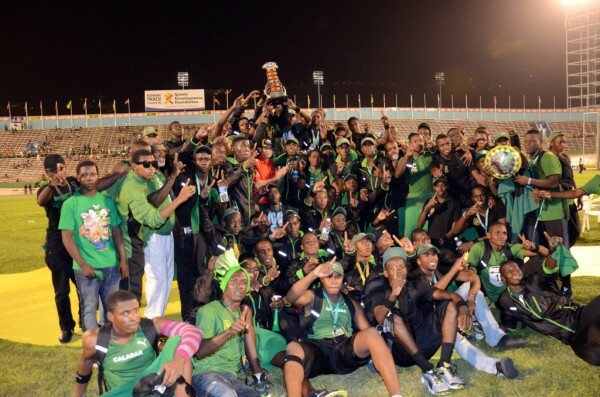 TEAM EFFORT: Calabar High athletes and supporters celebrate another victory. Utterly staking its claim as the most scintillating Jamaican sporting event so far this year, the 2013 ISSA/Grace Kennedy Boys & Girls Athletics Championships delivered five days of intense competition and no shortage of electrifying entertainment, highlighted by the shattering of several long-standing records. In fact, some 30 records were broken at this year's championships (the 103rd staging), which culminated before a jam-packed crowd inside the National Stadium on Saturday. By the time the dust settled, Holmwood Technical managed to clinch the Girls' crown ahead of early leaders Edwin Allen High while Calabar High secured their 23rd hold on the Mortimer Geddes Trophy. "It's a big win for Calabar, we expected a close Champs," said Omar Hawes, Calabar's assistant coach. "It turned out well for us because we got a little more points that we expected, but we managed well and this was just our year."